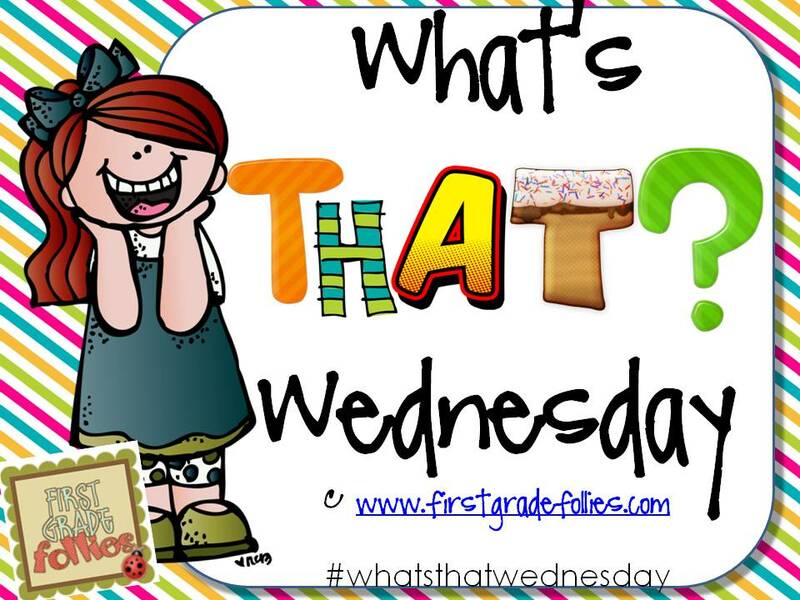 First Grade Follies: It's WHAT'S THAT? WEDNESDAY! This idea started last week when I was making cookies. While in the kitchen, I snapped a photo of my bowl of batter and posted it to Instagram asking people to make a guess as to WHAT I was posting. Hmmm, I wonder if this idea could ever take off for a linky? After conferring with my best friend (Hi, Cass!) who is not a blogger, she said she'd be interested to do it on Instagram (Follow me @ first_grade_fo). FUN! Soooo, if you're interested in joining in on the fun (which I hope that you are!) then post a picture or two of something interesting and LINK UP with us! The link is open until the following Tuesday so don't feel rushed! Include your WTW photos in another post for the week if you'd like! Hmmm, looks like I'm cooking again...or am I baking? Any guesses as to what this stuff IS? I'll schedule a post for later to reveal my objects! I hope you'll join in on the fun, too! Link is at the bottom of THIS POST! Also, I wanted to share a couple of pictures I took of the SUPERMOON this weekend. My husband is SUCH a champ! I don't think the naturalist expected to have this many people show up! He gave a short presentation about nocturnal animals (my firsties would have LOVED that!) and some facts about the moon, owls, and fireflies. That male fireflies "glow" in a J formation. The females wait in the grass for their mate! "Who cooks for you? Who cooks for you all?" Last summer, some severe storms wrecked the spots where the owls at Salt Fork were roosting. They made new roosts, right near where we were! I also learned how to FOX WALK! Did you know such a thing existed? It's for when you're walking outside, in the dark, and you're feeling your way with your feet. Nice and quiet, not stomping around. It was a clear weekend, overall, but some clouds moved in that evening that made it kind of tricky. We had to wait for awhile for the moon to rise above those clouds so we could see. We waited patiently and listened to a catbird, yearned for a cool breeze, and chatted with some "locals" who came in from town for the event. Because there were so many people there (probably close to 60!) , our "hike" consisted of walking down the road a ways, out from the lights of the campground until it was dark enough, and clear enough, to get a good glimpse of that big moon! It was gorgeous! We were bathed in moonlight! The naturalist then took us back to the amphitheater where he had binoculars and a telescope available for moon-viewing. He was also going to try and call in some owls. Cool! I'd brought my "good" camera with me and wanted to get some moon shots so we headed down to the beach where I could get a good shot of the moon and the lake. I can't WAIT for you to link up with me! Happy What's That? Wednesday! Picture 1 - Banana pudding? Lemon....something or other? Picture 2 - Something growing on a tree? Picture 3 - A blanket? A beach towel? Picture 4 - It looks kind of like a star? Does it light up? Hi Ashley! Thanks for linking up!